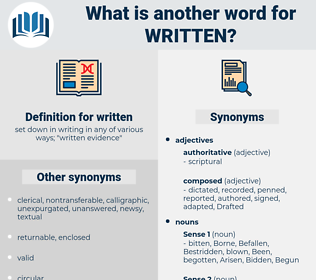 What is another word for written? set down in writing in any of various ways; " written evidence"
write-in, documentary, prepared, editorial, literary, clerical, developed. representations, Expenditures, books, submissions, contributions, Magazines, Pleadings, postings, tracts, statutes, letters. Underwritten, incorporated, integrated, articulated, Inserted, circulated, Translated, initiated, Generated, dedicated, Communicated, formulated, Denominated, implemented, demonstrated, executed, Contributed, reviewed, designated, Cited, directed, characterized, Cooperated, allocated, Deleted, Deleting, appropriated, Administered, observations, characterised, composed, Mentioned, elaborated, revised, Created, described, Stipulated, Originated, Indicated, anticipated, deregistered, Steered, identified, reported, completed, Introduced, questionnaire, devoted, published, located, Told, inscribed, repeated, Operated, subscribed, determined, stressed, detailed, Undertaken, Delivered, description, addressed, entrenched, Constructed, authored, expressed, Submitted, committed, Engineered, suggested, treated, inspired, gathered, Liberalized, Compiled, conceived, outlined, realized, transmitted, observed, Drafted, Performed, redrafted, Devised, presented, dispatched, co-authored, reflected, specified, admitted, learned, Enshrined, recognized, finalized, Rendered, reference, defined, Enacted, sustained, tailored, collected, sent, Exercised, Worded, carved, produced, labeled, labelled, Responded, spoken, pamphlet, Forwarded, itemised, timetabled, remembered, highlighted, structured, Answered, removed, increased, engraved, pronounced, intended, received, Managed, Targeted, enrolled, Deposited, Filed, emphasized, Issued, contained, Appeared, assembled, Followed, endorsed, turned, responses, exhibit, experienced, Referred, drawn, entitled, stored, L, concluded, Emitted, texts, Notified, exposed, Viewed, foreseen, destined, included, considered, attained, embedded, etched, risen, maintained, Suffered, Resulted, pledged, born, Replied, replaced, required, grown, accepted, come, enclosed, spent, Incurred, assumed, Undergone, scratched, conducted, taped, started, spelled, Purchased, Begun, undeclared, ended, enforced, regard, Regarded, projected, sponsored, moved, reduced, listed, covered, fired, Scored, embossed, message, amended, extended, announcement, opened, accrued, involved, Talked, mailed, Worked, Captured, request, requested, Consigned, penned, accused, shot, Comprised, expected, Awarded, guided, added, charged, finished, response, Returned, Been, Resumed, crafted, agreed, Phrased, designed, Achieved, styled, burned, adopted, Reached, stone, sealed, released, embodied, Offered, Provided, said, sunk, posted, stamped, commissioned, saved, lost, code, affixed, Tattooed, taken, Asked, cast, scheduled, Displayed, used, geared, codified, Anchored, found, raised, processed, marked, decreed, freed, shaped, held, form, formed, Subjected, Carried, given, Logged, Approached, Believed, placed, kept, led, framed, paid, built, staffed, Poured, Shown, Passed, Supplied, Happened, headed, linked, Brought, Looked, tabled, applied, Parties, Accounted, Aimed, Grounded, put, programmed, focused, dated, Shipped, biased, Counted, Met, seen, Couched, Caused, called, planned, Hoped, run, gone, Meant, Had, based, done, made, named, prepared, letter, paper, developed. common-law, oral, expressed, unscripted, verbal, verbalized, verbalised, uttered. Why should it, since he had not yet written to her? I don't believe I could have done without her at all if she hadn't written me those nice little letters.